Rinse chickpeas until water comes out clear, then soak them in about 12 cups of water overnight. (Add cooking salt and a tablespoon of baking soda to it: it helps soften the cheakpeas). Peel and slice mushrooms. (When cleaning mushrooms you should try to avoid using water, they would get soaked and loose taste). Combine olive oil, coriander and chilli pepper. Clean lime, grate zest and squeeze it. Add zest and juice to marinade. Add salt and pepper. Pour mushrooms in marinade and set aside. Get water to a boil. Peel and slice onion. Pour onion slices, bay leaf and chickpeas into boiling water. Cover (leaving some air coming out so it doesn’t boil over) and leave until chickpeas are tender. Mix it in a food mixer; add creme fraiche and season with cumin, salt and pepper. (Try it and add seasoning if needed). Peel garlic glove. Heat olive oil in a frying pan, add the whole garlic glove. Get the garlic all around the pan so the oil gets garlic flavour. Add bread slices cut in half. Leave 1 or 2 minutes on each side. 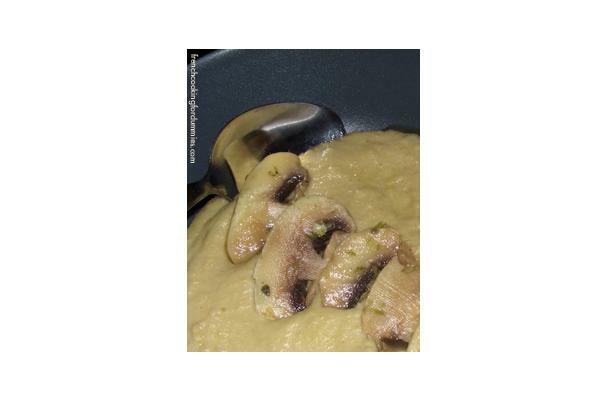 Serve chickpea soup adding marinated mushrooms on top with bread on side.